Ariana Grande Caught on Camera Kissing a New Boo... Big Sean Who? - Ooooooo La La! Ariana Grande Caught on Camera Kissing a New Boo... Big Sean Who? 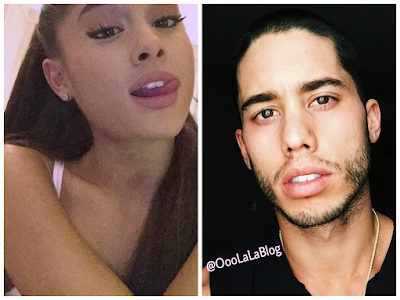 Ariana Grande and her alleged new boo Ricky Alvarez - a backup dancer from her 'Honeymoon Tour' - were spotted on a security camera kissing at a Wolfee Donuts in Lake Elsinore, CA last week. Ariana was also caught on camera licking donuts that were on the counter. According to TMZ, the couple decided to play a game of truth or dare with the goods and they dared each other to lick powdered jelly donuts on the counter when no one was looking. And, Ms. Grande moved on fast! Her and Big Sean only broke up a couple of months ago. Check out the full video footage here over at TMZ.